Sound, music and movement intersect to create a moving work of art in Milwaukee-based Wild Space Dance Company’s performance of “Caught Up in the Moment” Friday, March 31 at Lawrence University’s Stansbury Theatre. Tickets for the 8 p.m. show, at $15 for adults, $10 for seniors, $8 for students, are available online or through the Lawrence Box Office, 920-832-6749. The performance unfolds in interconnecting vignettes of shifting solos, duets, trios and quartets as audience members share the stage with the eight dancers as they invent impromptu movement set to eclectic, improvised live music by percussionist/composer Tim Russell and saxophonist/composer Nick Zoulek. Choreographed by Artistic Director Debra Loewen and intern Nicole Spence, dancers sing, hum and create sounds with costumes and props to create textured layers of sound and music while Russell and Zoulek respond to interlocking dances. Wild Space has been as an artist-in-residence at Lawrence since 2000, teaching dance classes, theatre movement workshops and choreographing for selected productions. Founded by Loewen, Wild Space Dance Company is celebrating its 30th season of inventive performances and innovative outreach programs. 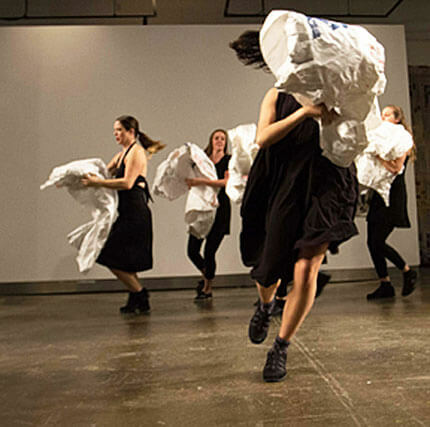 Known for site-specific works and artistic collaborations, Wild Space takes audiences on adventures through built and natural landscapes, visual art, history and the human condition through wry humor, clever choreography and emotionally-charged dance. It has toured performance work to Chicago, Minneapolis, New York, South Korea and Japan. Milwaukee-based Wild Space Dance Company presents an evening of organized chaos in “Carried Away,” a combination of new dance work and live music, Friday, April 1 at 8 p.m. in Lawrence University’s Stansbury Theatre. Tickets, at $15 for adults, $8 for senior citizens and students, are available through the Lawrence Box Office, 920-832-6749. 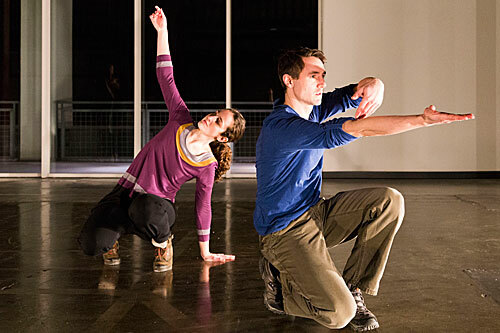 Monica Rodero and Dan Schuchart perform in Wild Space’s “Carried Away.” Rodero and Schuchart are two of Wild Space’s artist-in-residence teachers at Lawrence. Photo by Paul Mitchell. “Carried Away,” features Wild Space artistic associates Mauriah Kraker, Monica Rodero and Dan Schuchart along with improvisational musician/saxophonist Nick Zoulek of Duo d’Entre-Deux. Inspired by the creative daring that artists and performers bring to their craft, “Carried Away” reflects Wild Space’s commitment to fostering the work of emerging choreographers and cross-discipline collaborations. Wild Space Dance Company has served as a company-in-residence at Lawrence since 2000, bringing professional dance to the Lawrence community and providing students principles of dance art in performance through classes and workshops taught by Lowen and members of her company, including Rodero and Schuchart. Known for its site-specific dance events and artistic collaborations, Wild Space merges dance with visual art, architecture and music to create inventive choreography and emotionally-charged performances. It has toured performance work to Chicago, Minneapolis, New York, South Korea and Japan. Nearly 100 Lawrence University students representing more than 20 countries will provide a cross-cultural trip around the world in a pair of weekend shows for the college’s 39th annual International Cabaret. 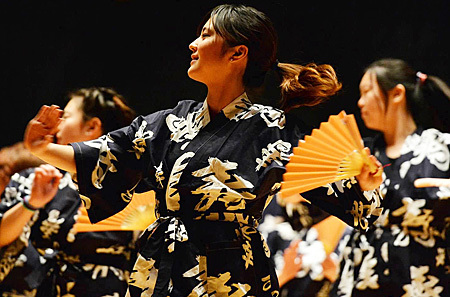 With the theme “All the World’s a Stage,” students will showcase their native culture in performances Saturday, April 11 at 6:30 p.m. and Sunday, April 12 at 3 p.m. in Stansbury Theatre of the Music-Drama Center. 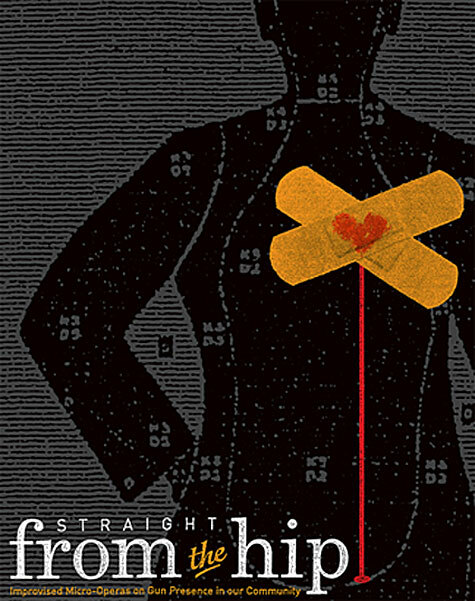 A free reception in the Warch Campus Center will follow Sunday’s performance. Tickets, at $10 for adults, $5 for students/children (under age four are free), are available through the Lawrence Box Office, 920-832-6749 or online at www.lawrence.edu/conservatory/box_office/tickets. The box office will be open one hour prior to Sunday’s performance. This year’s Cabaret features singing and dancing performances as well as two fashion shows with students modeling traditional clothing from their native countries. For the first time, Cabaret will include Duo Acro Balance, a performance that incorporates circus arts to illustrate the complex relationship with oneself. It features stylistic movements that showcase the blending of the artists’ training in traditional Mongolian contortion with modern Western theatrical movement. • a Vietnamese dance originating from the Central Highlands of Vietnam. The dance’s name translates to “Calling for the Rain,” and was used to communicate with God during a drought. • an Indian classical song from Northern India. Hindustani music dates back nearly 3,000 years. • Viva Santa Cruz Dance, a dance from East Bolivia. Called Taquirari, this dance is typically performed for Carnival. • a Korean history dance, an example of the dancing history of popular Korean culture, dating back to the 14th century. • a traditional Hawaiian song and dance. • A traditional Bengali song from Bangladesh. 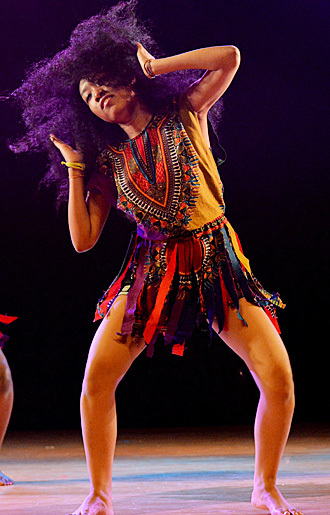 • a Ghanian Denkyem dance. • fashion shows featuring clothing from Bangladesh, China, Ethiopia, India, Indonesia, Jamaica, Japan, Mexico, Pakistan, Russia, South Korea, Thailand and Vietnam. 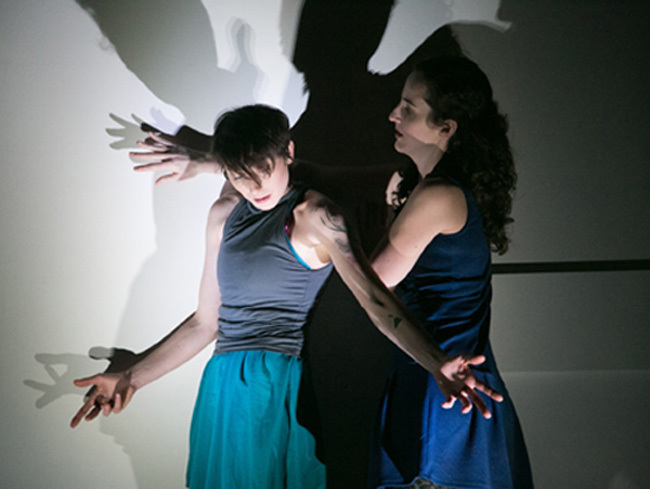 Weaving together nature, music, prose and a generous helping of humor, members of Milwaukee-based Wild Space Dance Company present “Luscious Layers/Fevered Sleep” Friday, Jan. 11 at 8 p.m. in Lawrence University’s Stansbury Theatre. Tickets, at $10 for adults, $5 for senior citizens and students, are available through the Lawrence University Box Office, 420 E. College Ave., Appleton, 920-832-6749. The performance features Wild Space affiliate artists Monica Rodero and Daniel Schuchart, and vocalist/performer Amanda Schoofs in an evening of original work and premieres. “Luscious Layers” fuses the sweet and forbidden, dreamy desires and tempting realities into full-bodied dances, including “In This Condition,” a solo piece about objects, actions and places that flows from spoken word to Mozart through movement, and “Here,” a duet blending dance and vocals. Wild Space Dance Company has served as a company-in-residence at Lawrence since 2000, bringing professional dance to the Lawrence community and providing students principles of dance art in performance through classes and workshops taught by artistic director Debra Loewen and members of her company. Named 2011 Artist of the Year by the Milwaukee Arts Board, Loewen has led Wild Space Dance Company for 25 years. Known for its site-specific dance events and artistic collaborations, the company merges dance with visual art, architecture and music to create inventive choreography and emotionally-charged performances. It has toured performance work to Chicago, Minneapolis, New York, South Korea and Japan. With a theme of “Around the World in 90 Minutes,” more than 80 Lawrence University students promise a whirlwind global tour in two performances of Lawrence International’s 34th annual Cabaret Saturday, April 10 at 6:30 p.m. and Sunday April 11 at 3 p.m. in Stansbury Theatre of the Music-Drama Center, 420 E. College Ave. A buffet dinner featuring international dishes will be served in the Warch Campus Center following the Sunday performance. Tickets, at $8 for the show and $15 for the show and dinner, are available through the Lawrence Box Office, 920-832-6749. Children four and under are free. Students will showcase traditional fashion from their native countries as well as perform a wide range of entertainment, including native dances from China, Japan, Latin America, the Subcontinent, Africa and Vietnam, music from Sri Lanka, Indonesia, Korea and Brazil and a group didjeridu performance .